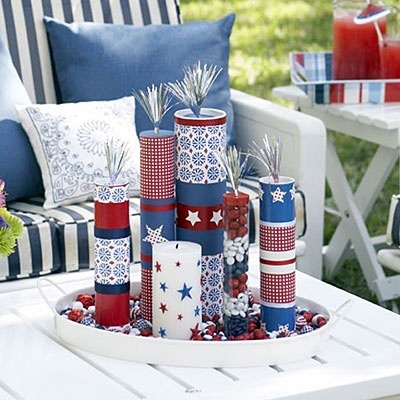 Patriotic holidays are especially nice to decorate for and so I came up with a round-up of festive 4th of July crafts to help you create your own decorations. All of these ideas have a touch of rustic and a spattering of chic to go along with some of your other decor! To get to the tutorials of all these great projects, simply click on the craft image and you will be taken right to the source. And, make sure to check out my driftwood American flag project from last year! It’s a fun wall hanging to do with driftwood stripes and grapevine stars. Stars and stripes flag by Craftaholics Anonymous. 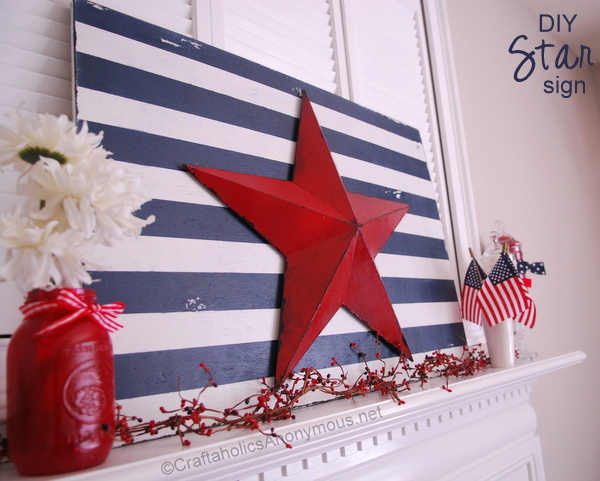 I love this rustic chic mantel vignette with the star and stripes flag as its center point. The simple styling of this distressed board flag is perfect for this setting and a festive holiday. 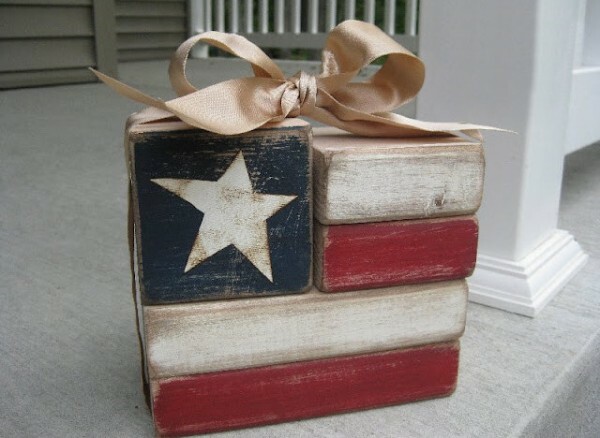 Wood blocks flag craft by Brown Paper Bags. This looks like a gift wrapped package perfect for a festive patriotic holiday. The rustic wooden blocks wrapped in the chic gold bow is a winning combination for a sparkly 4th of July. 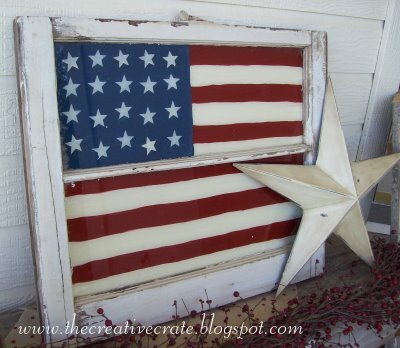 Painted flag window by The Creative Crate. Old windows are always a favorite here to decorate with and this idea is super creative and festive. The painted glass framed by the distressed wood of the window is both rustic and chic. The red peaberries and white star really set the whole display off. 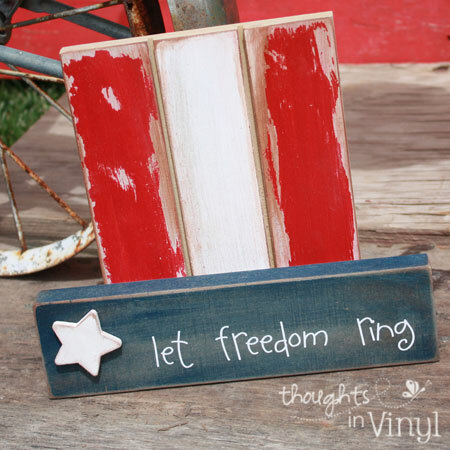 Let Freedom Ring craft kit by Thought In Vinyl. This “Let Freedom Ring” hat craft is actually a craft kit that you can purchase. All you need to do is assemble the parts and paint. The words are in vinyl! The instructions are easy to follow too. This is just one of their patriotic craft kits out of several that you can choose from. Just click on the image to see them all! Star spangled sparklers craft by All You. How inviting is this table top display? It definitely draws you in with the festive look! I love the fact that these candy filled fire-cracker favors were crafted from mailing tubes. Such a great re-purpose! You could also use empty Pringles container for this craft.